The sea glimmers in the April sun and the rocky walls east of the Mesco are imposingly displayed while the isles of Palmaria and Tino are lost in distant mists. This corner of Liguria is truly a worthy setting for the first appearance of the new Azimut boatyard flagship - a 116 footer - and with a helicopter you are in a privileged vantage point to admire her proportions in the right perspective. Only from up here can you see the harmonious marriage of lines and surfaces, ideas of elegance and power. Azimut-Benetti S.p.A.: Via Martin Luther King, 9/11; 10051 Avigliana (TO); tel. 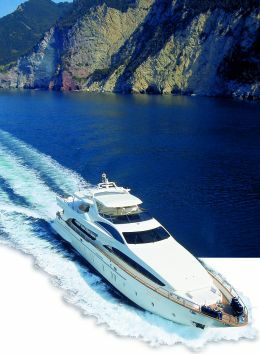 +39 011 93161; fax: +39 011 9316677-9367270; web site: www.azimutyachts.net; e-mail: proffice@azimutyachts.net. And as the great yacht reduces speed to enter Portovenere we make a last quick circling for photos against the picturesque scenery of the town on a dark green sea, or simply suspended in a fantastical and unreal back lighting. 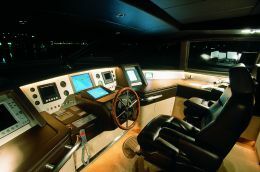 Prototype of a new series, the 116 footer in question is something of an exception in Azimut's production, an almost completely customised yacht: apart from the hull lines and technical specifications - the work of the yard designers - the basic philosophy and interior layouts were chosen on the precise request of the customer, or rather customers. 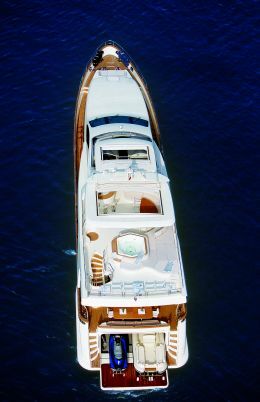 For the 116 footer is the property of several Mexican owners who commissioned architect Mauricio Gomez of Mexico City to create their living requirements aboard. The result is not a showpiece but rather a very informal yacht, designed for short cruises in the tropics and with a democratic division of the night areas between the various owners. The saloon on the main deck is declaredly dedicated to relaxation and the deep sofas in double rows are in no way suited, for example, to heated business discussions: one would soon fall asleep! The practicable floor area too has been given only relative importance, fairly bare in a saloon of this size, precisely to underline the private nature of the environment. The plasma screen set in the ceiling can also be oriented towards the cockpit table where lunch is normally served in fine weather. Alternatively there is a dining area forward of the living area with a walnut table seating ten and equipped with retractable chairs, created by Cappellini. 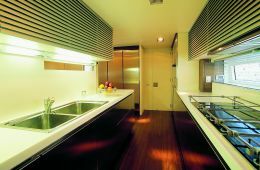 The adjacent galley, with Miele appliances, is developed along the port side of the deck, next to the crew mess. The use of mirrors contributes to a visual effect of increased depth. Access to the bridge on the upper half-deck is opposite. Here the skipper, amid dark leathers and wood, coordinates the various operations under way in an environment that is slightly reminiscent of a recording studio. 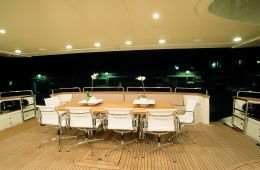 The main deck is completed by the "media room" forward where various photo-video re-recording systems permit the owners, scuba diving enthusiasts, to see their shots as soon as they come up again. It is also a place that offers a little privacy on a boat that is effectively somewhat crowded. 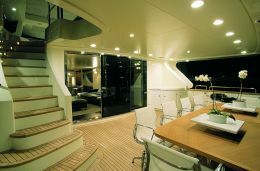 The very spacious flying bridge, accessible from the cockpit by a spiral staircase in teak, is divided into two areas on different levels: steering and living, the latter being a sundeck with hydro-massage, shower, corner bar, solarium and semicircular sofa with table. The top, suspended from the large but not invasive roll-bar, has electrically sliding wickerwork for optimal light-shade management while the floor, to avoid stressful carefulness, is not in wood but in normal antiskid. The interior architecture has favoured low and horizontal lines, restrained contrasts and sober colours. 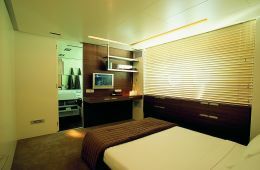 If one is living fully relaxed in tropical climates, supine or more or less so, horizons must be kept low if they are not to overhang; external lights must be carefully managed to avoid dazzle; mirrors placed where needed, reflecting or dark surfaces created; Venetian blinds and satin-finished surfaces added as required. 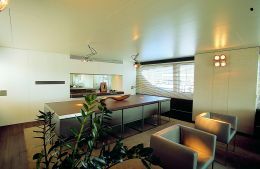 The need to reduce maintenance - there will be several children aboard - contributed to the choice of leather for sofas and cushions rather than delicate fabrics; treated leather and wood for the flooring; teak externally and streaked walnut and white oak for the furniture whose design Gomez defines as contemporary but not minimalist. 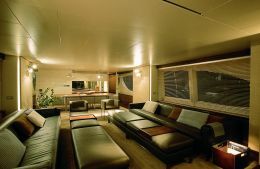 On the lower deck, four more or less similar cabins for the owners and a fifth for any guests, all of course with private bathroom and furnished with the same sober materials as the other spaces, confirming the informal character of this 116 footer where the presence of several people aboard for brief periods does not allow for the stowing of many personal effects. The wardrobes are reduced to the minimum and situated in fairly unusual places. Oval portholes give light in equal measure to cabins and bathrooms where the perspective is extended by the play of staggered mirrors, giving a considerable sense of depth. As for the on board electronics system, the rule was simplicity: in the tropics it is not always possible to find qualified technicians. The engine room houses two MTU 16V 2000 engines with Blue Line electronics and dry silencers to improve soundproofing. Electricity is provided by two 80 KW generators that can also be used in parallel. 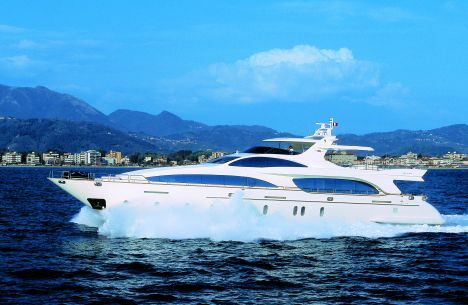 The air-conditioning system was built by Frigomar expressly for the Azimut 116. Mechanical equipment is completed with four refrigerating compressors, CO2 fire- fighting system, bilge pumps and pumps for dirty water and sewage. Distribution of fuel in the various tanks to balance weight and trim (18 cubic metres!) can be handled from the engine room by means of pumps. As well as carefully studied soundproofing, the temperature of this space is controlled by a system of external/internal sensors and progressive extractors. The other technical area, the garage, houses not only the tender and jet ski but also a space for the various central control units for stabilising fins, bow-thrust and quay- onboard insulation transformers. The hull, in fibreglass like all Azimut vessels, has a stern rake of 12.5° and is described as semi- planing. Two traditional type screws propel the boat at a maximum of about 25 knots and a cruising speed of 23. Another two 116 footers are already at the finishing phase in Viareggio. The layouts, supervised by Carlo Galeazzi, will be more traditional in comparison with this one-off, while the external lines are the work of Stefano Righini.